The price of an air strike…. As Europe witnesses a huge movement of people’s from Africa and the Middle East to its borders with many having fled life-threatening situations only to endure similarly hazardous journeys we should all pause to consider the human element in all of this. Those Syrians who have left behind a country bombed into near obscurity will have heard and then seen the air strikes, the huge explosions, the burnt out buildings, great plumes of smoke and lingering flames before they saw the bodies of the dead and the injured. The collateral damage. So few of us in the West have suffered the effects of ‘collateral damage’ and I wonder if more of us did then would our tolerance of news reports into deaths in other regions diminish and be replaced by a moral and just sense of outrage? 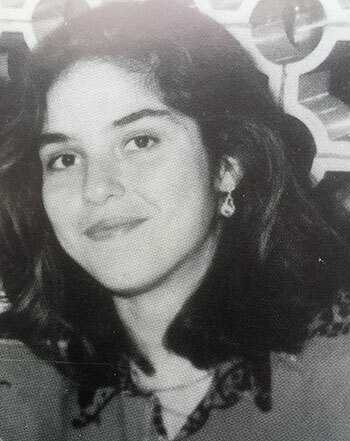 On April 15th 1986 Raafat Ghussein, a bright, beautiful eighteen year old Libyan girl had returned to her home in Tripoli for the Easter holidays following her school studies in the UK. Her father, Bassam worked for an American oil company and they lived next door to the French Embassy in the Libyan capital. As she slept in her childhood bed eighteen American F-111’s left English airspace and headed towards her, each carrying four 2,000lb missiles destined to bomb Libyan leader Colonel Qathafi’s home into rubble. But they missed him. They hit the French Embassy and destroyed it completely, six other nearby embassies were also hit. The day before the attack French embassy personnel were seen moving huge amounts of documents in the full knowledge that an attack was imminent, information they chose not to share with others. As President Reagan’s planes approached four of the aircraft’s pilots reported a problem with the laser-guidance system and were forced to retreat but not before another had dropped a bomb in the residential area in which Raafat slept. Her death was attributed to ‘pilot error’ and the multi-billion dollar joint operation by America and Britain to rid the world of Qathafi succeeded in achieving the exact opposite. Ten days earlier two American servicemen and a Turkish woman were killed in the terrorist bombing of a Berlin disco with some fifty others injured. The Reagan administration were quick to point the finger of blame at the Libyans whilst better placed, neutral intelligence sources would categorically state that it was Syria, under President Asad which had orchestrated and funded the attack. The then British Prime Minister, Margret Thatcher was forced to defend the mission, excusing the inexcusable. Noises were made by opposition leader, Neil Kinnock in the House of Commons the following day but nothing compared to those of the hundreds killed or injured in Tripoli the day before. Nothing compared to the grief of Raafat’s father. In Thatcher’s memoir she described the forty minute raid as ‘undoubtedly a success, though sadly there were civilian casualties and one aircraft was lost’ and in a final insult added ‘Television reports, however, concentrated all but exclusively not on the strategic importance of the targets but on weeping mothers and children’. Had she lived, Raafat would have been forty seven now, who knows where her life might have led her had it not been for the senseless decisions of the few. This post isn’t pro or anti Arab/West. It’s about life and the disgusting taking of it without question or remorse. It’s about Raafat’s life.